December 25, 2011 by Venky. After the Ooty climb CS was done, we had lunch and started to climb up the remaining 25km to Ooty to reach YWCA where we were put up. The initial kms of the climb was tough after a hard ride in the competitive section. But after a couple of downhill sections after Pykara, the legs came back and I finished strong climbing up the steep grades entering into Ooty. Arvind, Gaurav and I went shopping in the streets of Ooty after which we joined the rest of the folks for dinner in Taj Savoi. Had a great time there before we got back to YWCA and spending a cold night wrapping ourselves in a million layers of clothing and blankets just to stay alive. 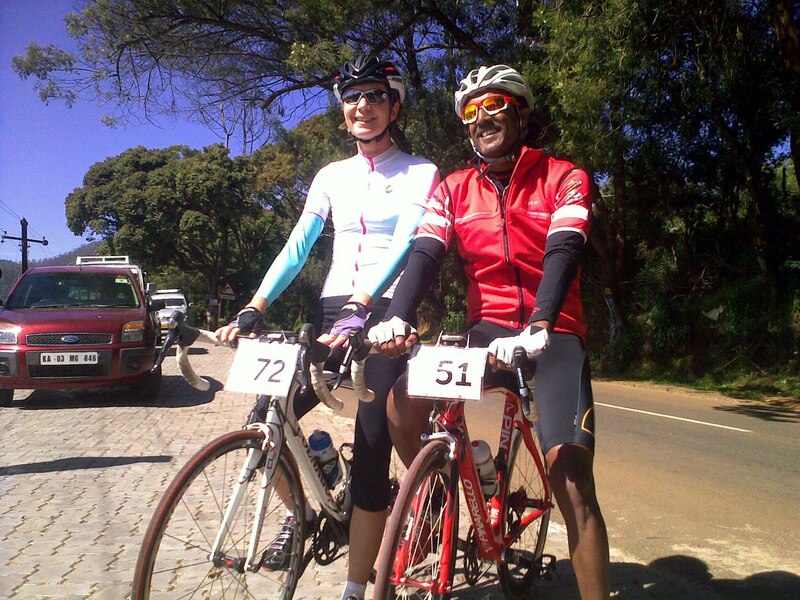 The champs of TFN’11, Vicki Nicholson and Rajesh Nair..
Next morning, the last day of the tour was from Ooty to Kodanad view point. After the Tour Director Francis Lobo delivered his ‘mostly rolling’ briefing for the last time, we started on our way out of Ooty. 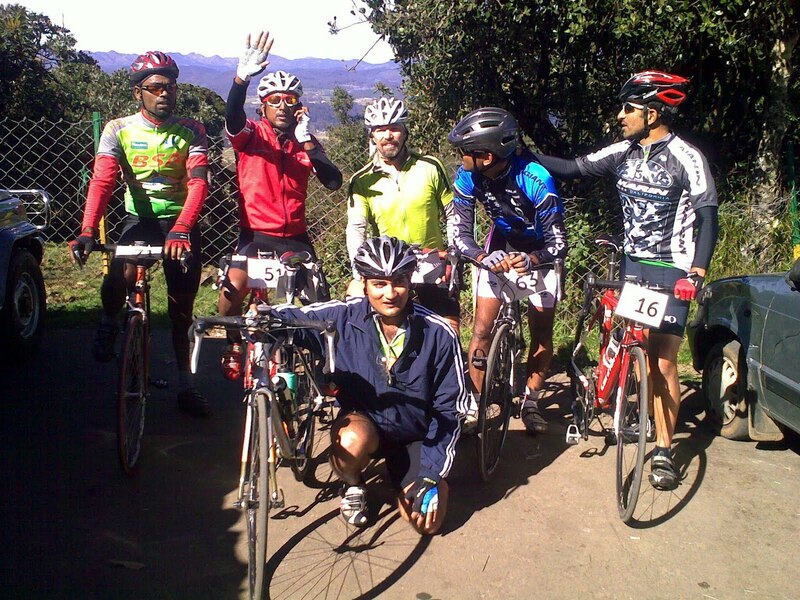 The first five km of the planned route was climbing followed by a downhill and rolling terrain to reach Kodanad. After the initial 5km climb, we reached a small junction where the road forked out. One of those leads us on the planned route to Kodanad and the other road would lead us to Doddabetta which, at 2637m/8650 feet, is the 2nd highest point in India south of the Himalaya. A few riders like Hari, Vicki, Jeff, Shankar, MarkH and Mark Anderson decided they want to climb upto Doddabetta before heading towards Kodanad. I was there on an earlier tour with family on a bus. But I wanted the Bulldog to have a shot at the steep climb because it might never make it this far again. The 3km climb from that point gains almost 200m in elevation. As I began to climb though, I had second thoughts about it as the road appeared completely broken and the rear tire seemed to be losing traction on the steep parts. 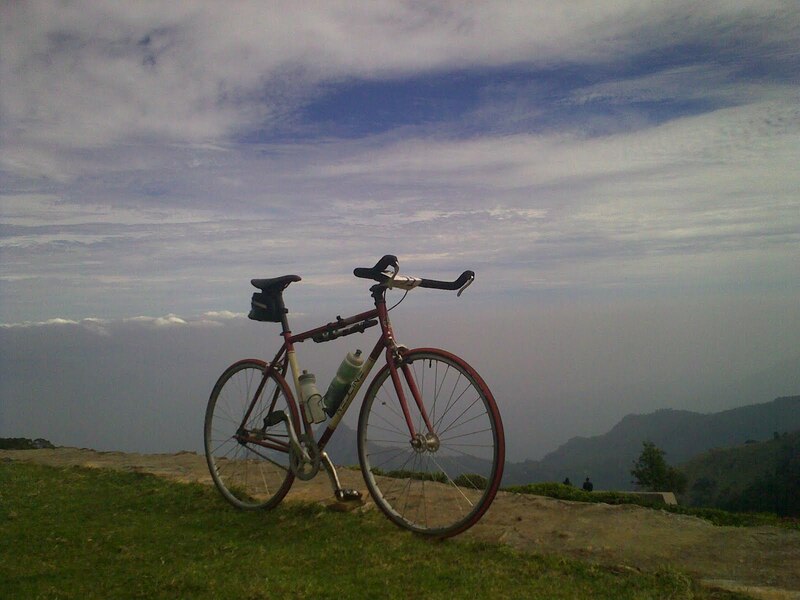 I brushed those thoughts aside and continued climbing and as I approached the top, saw Amrish and Baba Velo also making their way up. At the top just as we were posing for a few shots, Raj received a call informing of a head-on collision of a rider, Chako Cherian, with a tempo traveler. Head-on collision with a moving vehicle on a downhill sounded dreadful. We were shocked and feared the worst. We began descending with a heavy heart praying that the guy be safe. As we descended Doddabetta, Sumit who was waiting for us at the base informed that Chako was safe. We all breathed a sigh of relief and headed towards the accident site. 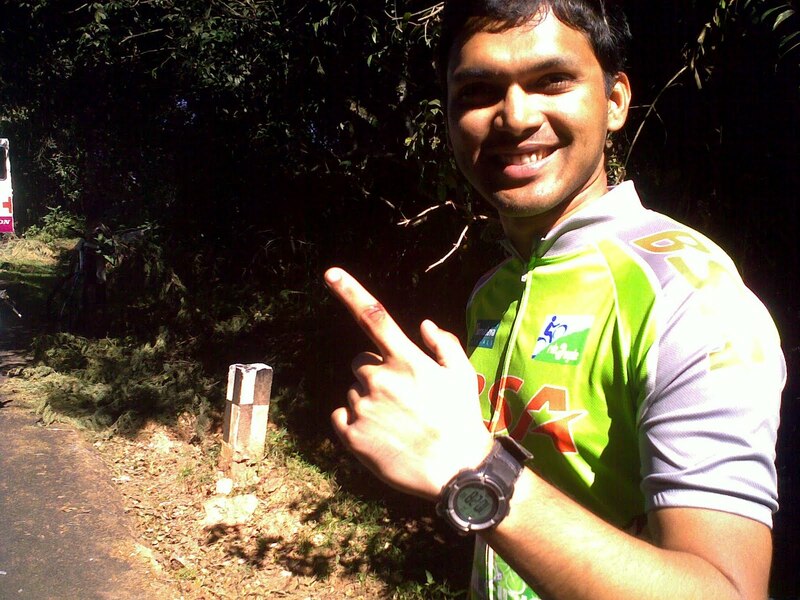 It was just after a blind turn on a downhill and a volunteer (Badri) was signaling from that corner for us to slowdown. As we stopped near the ambulance, I saw a guy being attended to in it. We saw Chako’s carbon bike broken at the head tube lying on the roadside. But I saw Chako safe and smiling outside the ambulance. I was confused as to who was in the ambulance. Apparently as Chako took that blind turn he headed straight into a tempo traveler which was directly in his path as it was trying to overtake a vehicle. His head hit the bonnet of the vehicle and made a huge dent in it and the helmet broke into pieces as did his bike. But the angel guardians that Chako employed must have been the best in the business. He escaped the accident without as much as a scratch. Oh, wait! He did have a small scratch on his left index finger. After the accident, another vehicle apparently wanted to catch the action and stopped on the road blocking the way. Maninder Singh, who was belting down the hill didn’t see that the road was blocked and ended up skidding after a sudden brake at that speed. Poor guy learnt the lesson about the importance of wearing a helmet by ending up with a couple of stitches above his right eyebrow. He also had a sprained left wrist. I’m sure he is a bit miffed his guardian angels who might in turn have been mad at him for not wearing a helmet. Glad that both the guys were doing fine, though. After knowing that they were doing fine, we headed down the hill towards Kodanad. The route was simply the best of the tour so far. Each day has been better than the previous day in the tour and the last day was simply the best. The roads were the smoothest we had on the tour and the scenery was amazing. We stopped often and took lots of pictures. I kept clicking away using my phone camera whenever I can as I rode on too. As we got closer to the Kodanad viewpoint, the views became surreal. They have to be seen to be believed. We packed our bikes into the truck at the end point, took one of the coldest bathes ever and had lunch in banana leaf. After the presentation ceremony, we winded up the tour in one of the most scenic of the locations and started to head home. I felt sad that the tour is over and also happy that I would be seeing my family after 8 days. Even on the mostly downhill route for the day, the elevation gain was about 800m in 50km on the last day. We climbed nearly 9000m in 803kms on the tour over 7 days. Why TFN On A Fixed Gear? The idea of doing TFN on a fixed gear bike started as a vague thought after I successfully completed my first 100miler on this bike in Vermont last year. The idea of riding around 800 hilly kilometers on a fixed gear bike looked extremely challenging and almost impossible. Then when I went to Ooty with Vineeth and climbed it successfully, the thought didn’t sound that impossible anymore. But the prospect of riding a fixed gear and not being able to coast down those hundreds of hills still looked immensely challenging. Gradually that challenging idea has become a personal goal. That personal goal has motivated me to lose the extra weight I had on me because I knew that hauling any extra weight up any climb is going to be taxing. So, becoming as light as possible was one of critical success factors in this challenge. Training consistently and practicing climbs helped me lose those extra kilos and get as fit as I can to take on the challenge. The Bulldog has served me well on the tour, during the 10000 kms of training for the tour and gave me many memorable rides over the last one and half years. Apart from my trusted work horse, the Bulldog, there were may people who helped me get here. My wife who has not only put up with my madness and single minded eccentricity but also encouraged me in pursuing my goals. My ride partners who have let a dumb fixed gear rider break into their roadie pacelines, putting up with his million photo shoots on the rides, slowing down for him at times, pushing him to do better at other times and helping him become a better rider with their words of wisdom. For the organizing team at TFN for making it possible for me to ride the tour. Dude, that was amazing. Training unleashed your true potential. all the best. You are one amazing guy- sorry God- Lord Venky!! Venky my man, balls of steel. Congratulations on completing the ride successfully on your bulldog… Way to go. I am taking inspiration from you and start training to reduce those extra kilos off my body.